Hi - I`m Berta - a bright yellow ball of energy. My first Mickaboo foster parents nicknamed me "Berta Warrior Princess" because I am strong and fearless. I love to fly and if you open my cage door I will fly circles around the room. But don`t worry, when I`m done, I will fly right back into my cage and land on my perch. I am interested in everything around me, especially my new budgie friends, Cody and Loo Loo. They`re a little stand-offish right now but I know they`ll come around. After all, I`ve charmed every person I`ve ever met. 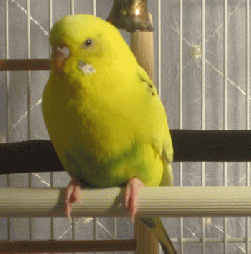 If you`re interested in meeting a happy, full-of-life, ray-of-sunshine budgie, just contact my adoption coordinator. She`s pretty sure you won`t be able to resist my charms either.